Little Labs IBP, Other Effect Plug-in from Universal Audio in the UAD Plug-In series. loudfunk's review"Phase Off? This will fix it!" As always with any U-Aduio plug-in it's merely download the authorization file, click on it and start working. Genius! Unless you decide to get the actual Little Labs hardware this is an absolute must have for any studio. Recording guitars with multi miss has never been easier to finally get the pause right. The Little Labs IBP Phase Alignment Tool easily eliminates the undesirable hol- low comb-filtered sound when combining out-of-phase and partially out-of-phase audio signals. Designed as a phase problem-solving device, the award-winning Little Labs IBP (“In-Between Phase”) has established itself with audio engineers as not only a “fix it” tool, but as a device for manipulating audio phase as a creative, tonal color tool as well. Whether combining direct and microphone signals, acoustic guitar and vocal mics, drum kit mics, or multiple split-guitar amps, the recorded audio signal phase can be quickly and easily controlled with the Little Labs IBP Phase Alignment Tool. Phase Adjust is the main parameter in the Little Labs IBP. It is a continuously variable control that shifts the phase of the input signal. The range of Phase Adjust is either 90° or 180°, dependent on the Phase Adjust 90°/180° switch. 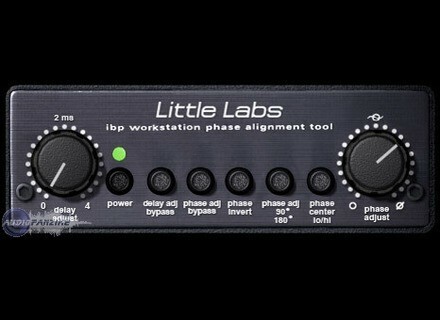 The Little Labs IBP hardware is an all-analog device that uses analog allpass filters to produce phase shifting. Allpass filters displace signals in time as a function of frequency (they are frequency dependent). The modeled UAD ver- sion accurately models the hardware along with all its idiosyncrasies. Therefore phase shifting using the Phase Adjust knob is not “perfect” like mathematically-manipulated signals in the digital domain. When Phase Ad- just is set to 180° on one of two identical tracks side-by-side, the signals will not cancel as you may expect. Unlike the “analog” Phase Adjust parameter, which is frequency dependent, Delay Adjust is purely “digital” and shifts all frequencies equally. Delay Ad- just accomplishes the same function as manually moving an audio region for- wards in the timeline so it plays back a little later in relation to other regions. Installation as usual at AU: absolutely no problem. Even with a PC that does not the Net, you download an small file from another post, you double click on it once copied on the right PC and you're done. Config stable (DAW utilis is a SSL / Soundscape SS32, tireless running with Editor / Mixer SSL V5.5). All on a W2K PC with 4 gigs of RAM ... STABLE! I use it for some months now. I understand the principle of the plug (with the help of very good instruction manual of the manufacturer of the hardware). APRS, I feel there's an effect of "fuller" when, for example, a guitar does saves a hurry and that sound is "weird"
I do not know how the hardware works, but if it works better than the plug, it can be useful.